We at Atlanta Motorsports Park feel strongly about the safety of young drivers—especially when they get behind the wheel of a car for the first time. We’ve therefore made it our mission to do our part to reduce traffic accidents among teenagers. Our non-profit DriveStrong program is aimed at drivers aged 15-21 and provides an opportunity for young or experienced drivers to learn vital road survival skills that might one day save their life. If you are over the age of 21 please call and we can make the necessary arrangements. We teach drivers how to refine their handling and how to navigate their vehicle under a wide variety of treacherous road conditions. Using expert and professional driving instructors we emphasize greater street and spatial awareness, how to handle wet or icy conditions, obstacle avoidance and many other topics designed to give you the survival skills that might one day save your life. We help young drivers understand the risks and dangers of unsafe driving (including distracted driving) as well as foster a healthy respect for their car and the road. Below are answers to common questions about the program. • How long is the AMP Street Smarts Teen Driving Program? • What time should we arrive? •What is the curriculum for the program? In a controlled environment, teens get behind the wheel of a new BMW 3 Series and experience a wide range of driving conditions. AMP driving instructors are in the vehicle with the teens giving immediate feedback on safety precautions and vehicle handling corrections as students respond to real-world scenarios. We will use our cutting edge skid pad to teach them skid control. We will use our first of its kind Ice Hill to demonstrate real world, reactionary scenarios whereby remote control we can “pop” up water jets for them to avoid on a polished slick surface; similar to that of a car, child or object, “springing” up before you. Learning vehicle dynamics help drivers safely maintain control of their car at all times and experience the importance of patience in the process of managing the load transfer of the vehicle. Maneuvering vehicles through a series of courses simulating real-life road conditions, students learn what best to do in the event of an unexpected hazard. Teens learn effective ways to handle unexpected braking and panic stops before an accident occurs. AMP driving instructors teach students to focus on where the vehicle needs to be rather than on the object they are trying to avoid. •Is there a cost for the AMP Street Smarts Teen Driving Program? •Where is the Teen Driving Program located? All programs will be held only at Atlanta Motorsports Park in Dawsonville, GA 30534. •Is there a limit to the number of students per class? Yes. The maximum number of students per class is 30. We’ve found that this gives each student an adequate amount of time behind the wheel. •Is there an age requirement? The AMP Streets Smarts Teen Driving Program is available to either Lerner’s Permit or Licensed drivers, ages 15 to 19. While this program targets younger drivers, we also provide the course to any driver who feels they would benefit from more advanced driver training. •Is there a pre-requisite for attending the class? Yes. Each student must have the minimum allowed by the State Motors Vehicle Department where they are licensed. • Student’s minimum age is 15 years old. Must have 25 hours of basic driving experience (behind the wheel) with a parent or guardian. • Must be permitted for a minimum of 6 months prior to registering for AMP Street Smarts Teen Driving. •Does my parent need to attend the class with me? No. We only require parents or guardians to check you into the class. We are open to them attending for breakfast, getting to know the instructors but once the class has started, we ask that they wait in our member’s clubhouse where they can observe the class! At the end of the day, we will allow students to demonstrate techniques to parents during ride-a-longs. •Do I need a waiver signed by my parents? Yes. All minor students MUST have a waiver signed by their parent or guardian. All minors will be asked to sign a separate waiver as well. The Parent/Guardian must deliver the signed waivers in person or the waiver must be notarized prior to being presented at the school. • What do I need to bring for my Teenager? • Do race car drivers teach the classes? 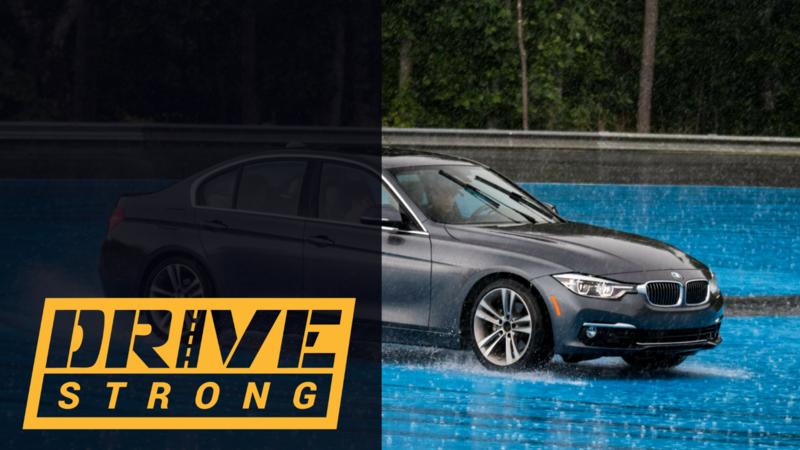 DriveStrong Instructors are experienced in different driving programs and driving education schools. This program is not about racing and will not teach any techniques regarding racing. • Does the DriveStrong Program provide vehicles to use in the class? Yes. Students will have the ability to drive new 2018 BMW 330i vehicles provided by BMW NA. • Does the DriveStrong Program provide certificates for discounted insurance? Each student will receive a certificate of completion. • Does the DriveStrong provide food for my teen, what about parents? Yes, snacks/drinks and lunch is provided. If you would like to purchase a parent lunch please call or email link below. • Can I Cancel after I register or receive a refund? Refunds will not be issued for cancellations within 48 hours before class or no shows. • Can I ask for a current registration to be moved to a different date? For any registration changes please email info@drivestrong.org; no changes will be issued within 48 hours of an event.